November 15, 2018 -- Using transparent, flexible 3D-printed models of the lung helped physicians improve patients' understanding of lung cancer surgery -- including its harms and benefits -- during informed consent consultations, according to an article recently published online in Seminars in Thoracic and Cardiovascular Surgery. The informed consent process for lung cancer surgery requires physicians to explain surgical resection and alternative treatment options to patients. But their understanding of the complex procedure after these meetings often remains inadequate, noted co-first author Dr. Soon Ho Yoon and colleagues from Seoul National University Hospital in Korea. To improve this process, Yoon and colleagues created patient-specific 3D-printed lung models for 20 patients who required surgery for suspected stage I lung cancer as detected on chest CT (Semin Thorac Cardiovasc Surg, November 6, 2018). 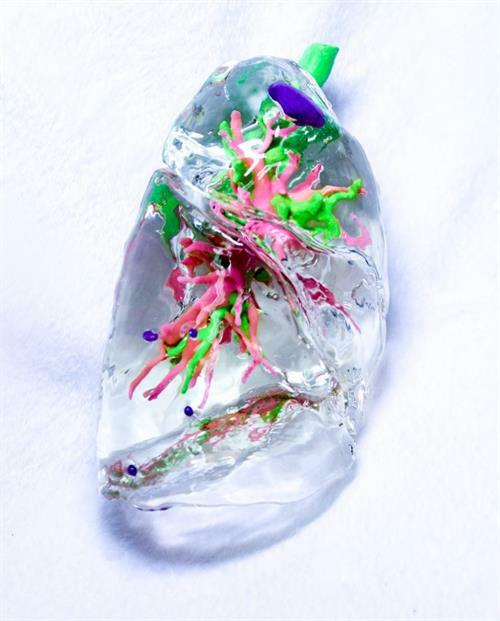 Transparent, flexible 3D-printed lung model of a 99-year-old man with primary lung adenocarcinoma and minimally invasive adenocarcinoma (purple) in the right upper and lower lobes. Tracheobronchial structures are in green and pulmonary vessels in pink. Image courtesy of Dr. Soon Ho Yoon. Making the lung models involved using computer software (Medip, Medical IP) to segment and process healthy lung structures and lung cancer from the patients' CT scans. This was followed by 3D printing of the models with four different photopolymer materials -- including a transparent flexible material -- to replicate the texture of lung tissue. Preparation and manufacturing costs amounted to approximately $1,000 per model, and it took an average of 13 days to create and deliver the models. The researchers were then able to discuss the lung cancer surgery with the patients using a standardized document for informed consent, along with the patients' CT scans or 3D-printed lung models. Follow-up questionnaires revealed that those who had the opportunity to examine individually tailored 3D-printed lung models had better comprehension of their upcoming surgery, compared with patients who did not have access to the models. The 3D printing patient group reported slightly higher scores regarding their understanding of benefits, risks, and alternative treatment options, as well as their overall satisfaction, than the control group did. However, the only category with a statistically significant difference between the groups was patient knowledge (13.6 versus 11.8; p = 0.02). "The enrolled patients and surgeons could freely touch, rotate, and see through the transparent, flexible handheld 3D-printed models, leading to straightforward anatomic comprehension of lung structures and the location and extent of lung cancer. ... Thus, 3D-printed models may be a promising tool for improving patient satisfaction, which potentially enhances surgeon-patient rapport and surgical outcomes," the group wrote. Yoon and colleagues now plan to conduct a larger follow-up study to assess the usefulness of 3D-printed lung models in explaining surgical resection to patients with more advanced stages of lung cancer.